Tucked deep in the Montford Historic District of Asheville, among the Queen Anne Victorians, Georgian manors, and arts and crafts cottages, is the 1920s bungalow Jennifer Thomas calls home. On any given day, she can be found in her kitchen—hair tucked under a cap and sleeves rolled up—kneading a ball of dough for fresh bread, chopping fruit for a luscious tart, or putting a batch of biscotti in the oven. It’s not uncommon to find a visitor or two perched on a stool in the light-drenched room, sipping a cup of warm tea and chatting with Thomas about the latest neighborhood happenings. But Thomas is more than the friend up the street with a knack for baking, and her abode is more than a home: This is the Montford Walk-In Bakery, where confections bring a community together. The visitors who make their way up the drive are customers who receive an e-mail at the start of each week announcing what treats Thomas is whipping up. They place an order online, choosing from delicious pies, cakes, cookies, tarts, and breads baked in the backyard brick oven, and pop by to pick up their purchases at the week’s end. Thomas has long been a presence on the local culinary scene. Fifteen years ago she ran a chocolate company out of the kitchen at The Market Place restaurant to supply local eateries. In 2008, she earned a baking and pastry arts degree from Asheville-Buncombe Technical Community College and apprenticed with Madison County baker Steve Bardwell of Wake Robin Farm. 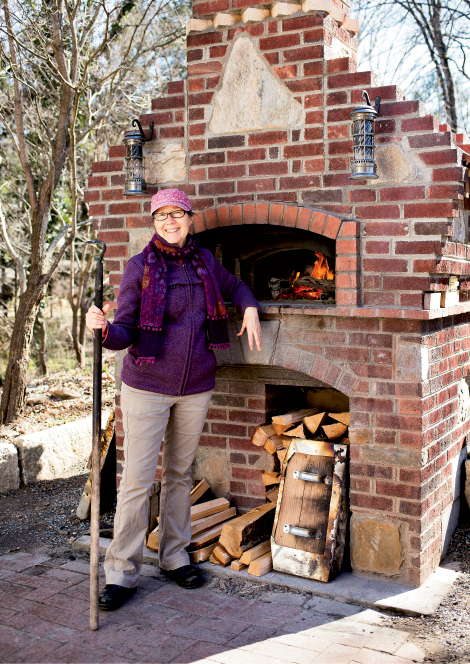 These days, she occasionally leads baking classes and demonstrations through the Seasonal School of Culinary Arts and during the annual Asheville Artisan Bread Festival. Thomas began her cottage business, which is certified by the N.C. Department of Agriculture, in 2009. She likens the business to a baking club rather than a traditional commercial operation, and hosts an annual pizza party, as well as truffle classes and gingerbread decorating sessions with children in the winter. Particularly during the holidays, Thomas is a lifesaver for folks short on time but determined to add a home-baked element to their feasts. Think ginger-pear and fig tarts, chocolate-dipped almond biscotti, sweet potato rolls, pumpkin breads, banana nut muffins, and apple-cranberry galettes. There are also wild sourdough yeast breads, foccacia, and grainy European-style farmer breads. Her baked goods are rustic, hand-formed, and authentic. “A lot of my winter recipes have themes of nuts, fruits, and spices for warming winter flavors,” Thomas explains. Like any loyal member of the Slow Food movement, Thomas works with what’s in season and harvested locally, shopping tailgate markets for inspiration and ingredients. Often she doesn’t even need to look beyond her own yard for what she wants. For instance, the figs for a tart and rosemary in the twisty breadsticks come from her garden plot. In preparation for the holidays, Thomas delves into old family recipes, including St. Lucia Day buns, a traditional Swedish pastry. As per custom, the buns are served to parents on the morning of December 13 by the family’s eldest daughter. Saffron, vanilla, fresh nutmeg, and fluffy potato flour make up these slightly sweet, voluptuous rolls dotted with raisins. Over the years, Thomas has fine-tuned the recipe, cutting back on the sugar, as well as adding whole wheat pastry flour, as well as spices that accentuate the fresh oranges and cranberries. It’s baking tips like these that she imparts to her fans in Sunday blog posts, which have become another way of connecting the community.